had surgery to remove a bone in my hand, which has successfully reduced the pain to almost nothing. been to Harry Potter World and had a fabulous time. been able to start knitting properly again after over 2 years. seen various friends and family. been to Southampton for a weekend in November. been to Brighton for a weekend just before Christmas. been cooked a special Christmas dinner by fabulous hubby, last night. So a very good year, all things considered. Hubby’s health has been good too, and as long as we keep taking our medication, all will be well. He’s currently singing aloud, with gusto, to Van Morrison “Goodnight Irene”. This week will be busy, busy, busy. 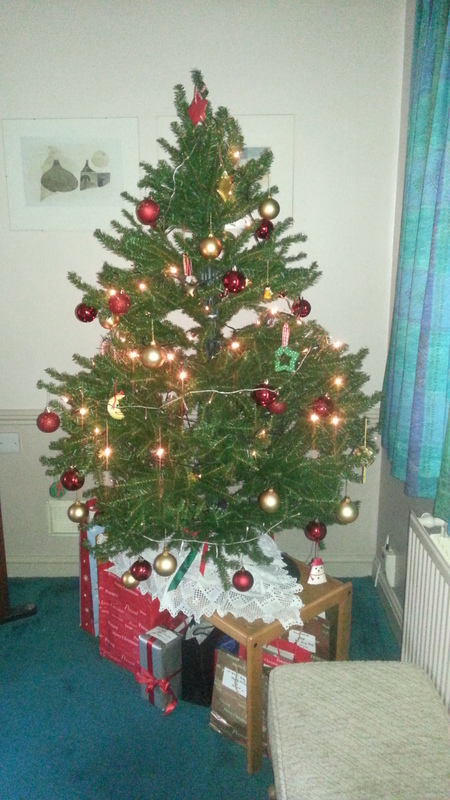 All the presents are organised, wrapped, and under the tree, which we put up today. I even crocheted some snowflakes to put on it, which I’m very pleased with. Then forgot to put them on until I’d taken the photo. Oh well. They do look nice. For those of you who haven’t noticed, there is something particular on the top of our tree. Not an angel, not a fairy, but . . . and yes, we are well aware of the significance! 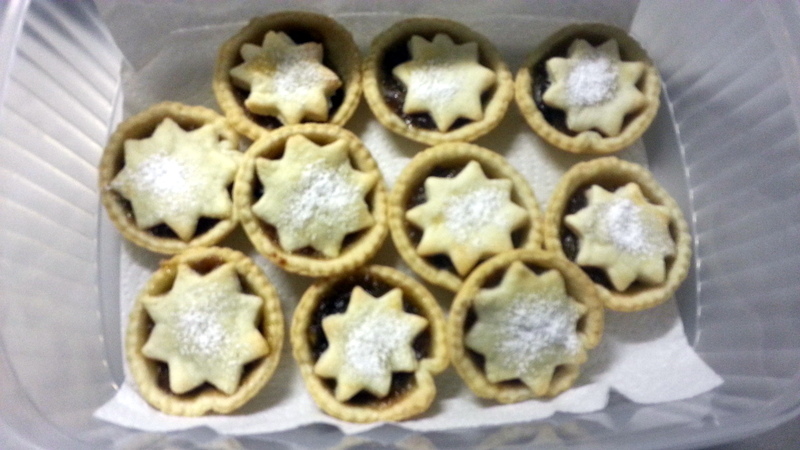 Also made some mince pies today. The pastry and the mincemeat are bought from the shop, but there’s just something about cutting out the shapes myself, plonking the mincemeat in, and cooking them in my oven means they do look and taste home-made. I can’t buy the ones already boxed in the shop, they all have butter in them. My back has recovered from this morning’s exertions, thankfully. Two paracetamol and three hours’ sleep. As well as the tree and the mince pies, hubby was having extreme difficulty with his music system, which is complex and computerised. The latest CD he had wasn’t appearing in the list, and when it did appear, wouldn’t play. It’s taken hours and hours of frustration, tweaking, rebooting various parts of the system, uninstalling and reinstalling various apps on the tablet, and eventually, due to some combination of all those things, it finally worked. But we don’t know why. Grr. Luckily he contributes to a forum specifically about such things, so he’s going to mention it there. In the good old days, we just popped a CD in the drive. But the sound wasn’t as good. His music system is his pride and joy, and the effect that listening to music has on him is the same effect that knitting or crocheting has on me. Busy tomorrow, busy Wednesday, baking Thursday, busy Friday. I shall be glad when it’s the weekend! Luckily I’m just a tad obsessive and am all ready for Christmas. It’s just hubby and me this year, which will be lovely. Seeing family before and after though, which will also be really nice. Knitting – going well. The physio is definitely helping my hands. I have exercises to do, and once a week they massage the hands and treat them with ultrasound. Excellent. I’m knitting the last Christmas present at the moment, everything else is done. Just need to sort out the baking I’m going to do. I have the ingredients for the cake (this year it’s going to be the dairy-free, egg-free fruit cake, one with marzipan in the middle for me, one without for hubby). Need to sort out the mince pies pastry and enough flour and eggs for the cakes I’m taking to various family dos. Exciting. I’ve also been crocheting. Nothing large, and no photos yet (don’t want to spoil anybody’s surprise . . .) but I am quite pleased. Results have been blocked, starched, and are currently drying. Did a bit of gardening this morning – only about 45 minutes. The dead rudbeckias looked horrible, and so did the asters, so they’ve had a severe cutting back. Also dug up an old dead no-longer-ornamental grass, and picked loads of moss off the soil. I’ve filled three large tubtrugs but that’s ok. We need to take a trip to the tip this week anyway. Saw my great-nephew last week. He is just delightful. Crawling, cruising, almost walking, and such a happy little soul. Finally, here is a photo of the cat. 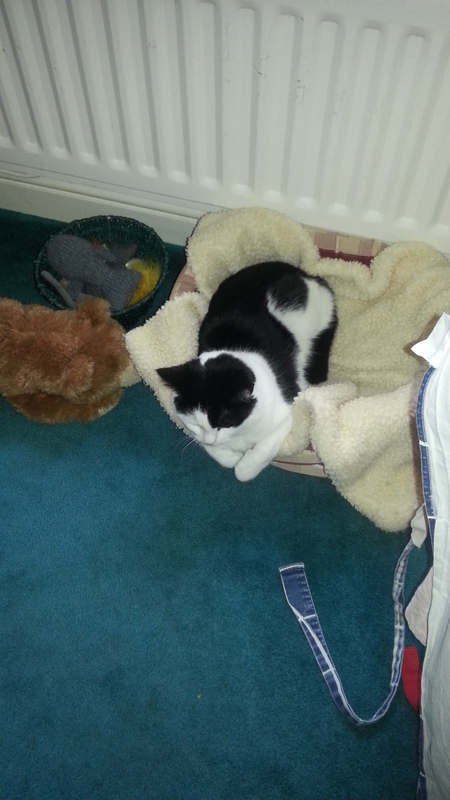 This is where we find her when we’ve been out, and she’s been in, confined to the kitchen and utility. She has food, water, toys and her tray in there, so it’s like a little bed-sit for a cat. But she just goes into her little bed.